← Page 200 – Stab! Pinkie Pie! Also, brunet Fry! Where did you see a pink pony? The only two pink things I see are Unigirl and Rainbow Princess. Come on, that’s clearly Straw SpongeGroucho. Yep. Definitely not anybody in disguise. A couple of these people in the audience paid to be drawn in the audience then never got back to me despite numerous attempts to contact them to get a reference pic. For them, all I could fine were twitter or google profile pics of cartoon characters, so I stuck those in as a tribute to them mystery donors. Nice seeing Bearmageddon make an appearance (I assume that’s why the bear is in the back row). Yep, totally and completely over. Absolutely nothing will happen. Nice of Walter White and Owlowiscious to attend in the back-right, there. 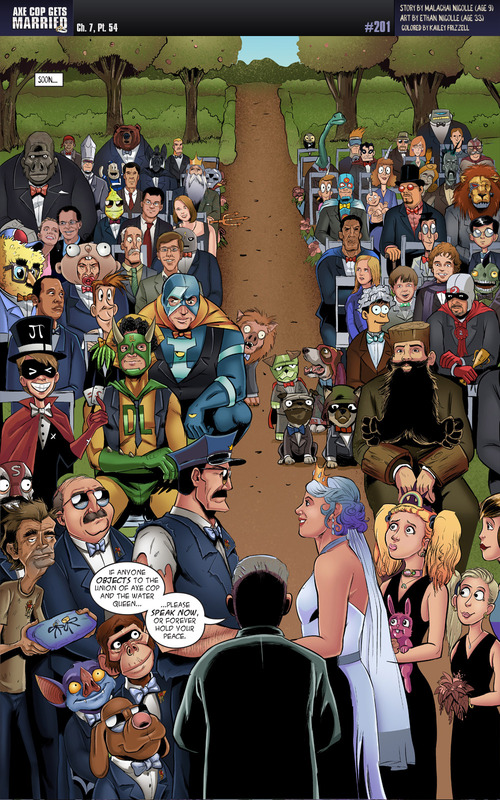 My personal favorite guest is the cyborg lion man in the middle row. Look at all those familiar faces! There’s even the tubby doll too! Is that Pinky Pie in disguise over there on the left? Is that… is that a Russian lumberjack with FISTS coming out of his BEARD…??? I would take a guess and say that’s Stumpwater Jack, according to the tags. Yes! More of Stumpwater Jack! Is that Gax from “Wondermark” in the back? 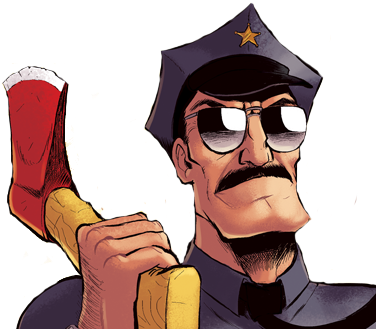 Oh man, I really hope Axe Cop actually does end up getting married at the end of this. I keep expecting some last minute plot twist that throws it out of wack. OMG at far left is pinkie pie’s hay disquise! I love that! ur u a brony?!?! Haha no, but one of the people who sponsored my wedding was and they never sent me a photo, so I used their avatar which was that. Wow! What a great page! Well done, Ethan! ermagerd tinfoil fry from futurama movie?